At present it has become an obligation to publish research papers and articles in research journals. Many teachers inspite of having enough knowledge in their respective subject can’t fulfill the demands of UGC due to their inappropriate presentation or negligence of writing skill. At present the process of sending the research article and papers have become computerized and online. Many scholars frequently make queries to us regarding their research articles and papers. Hence the following suggestions can help for writing research paper and articles. 1. How to write a Research paper ? A research paper can be written on any topic in concerning the subjects. A research paper comprises such as abstract, introduction, word pattern, review of literature, analysis and bibliography. 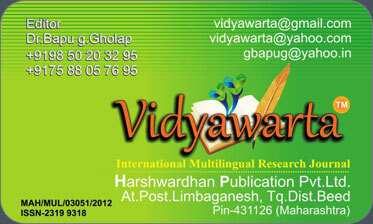 Vidyawarta publish articles and research papers in all subject and in all faculties. 2. How to send papers ? 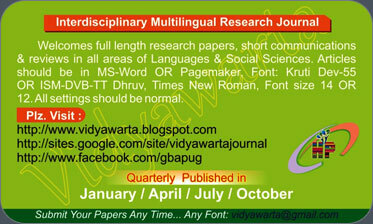 Computerized typed matter of articles be sent only by e-mail to vidyawarta@gmail.com in Pagemaker or MS-word format file. Please don't sent PDF, scanned pages or photos pages. Articles be sent using their own e-mail ID. 3. About format and font ? For Hindi and Marathi, use DVB-TT-Surekh or Kruti Dev 055 or shreelipi 708, size 14, normal setting. In case of the use of graphs, maps, pictures and tables all be used in the right places and in appropriate setting. Articles may be written in 3000 word (5-6) pages. After fulfilling all these formalities you may contact the editor, Bapu Gholap. 4. Do not forget this..! 1) Write your full name, Address, Pin code, Mob. No. Email ID. etc. 2) Make sure whether your email has been received or not to Vidyawarta. 3) You may deposit the amount of the number of copies you required. 4) Send the receipt of the deposited fee on whatsaap or email. 5) The research paper should be unpublished, complete and correct in all aspects. Regd. Trademark- Govt. of India.